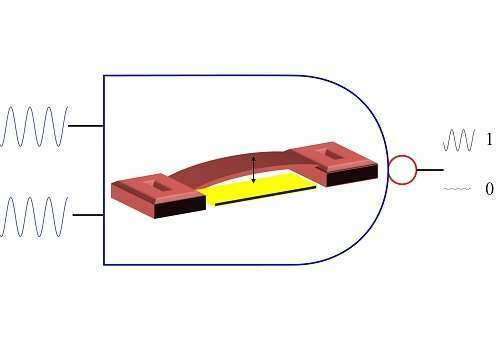 "Electromechanical systems offer a major advantage over existing technology in that they are leakage free: that is, unlike electrical transistors, they only consume power when switched," explains Ilyas. "They also require fewer gates per computing function, resulting in lower complexity, and they can be fabricated with higher integration densities—it is even predicted that these systems could be scaled down to the molecular level." "We use an electrical signal as an input, which causes a clamped polymer microbeam to vibrate at a certain resonance frequency," says Jaber. "This in turn generates motional current as an electrical signal with the same frequency, which could then be cascaded into the input of another MEMS logic gate."